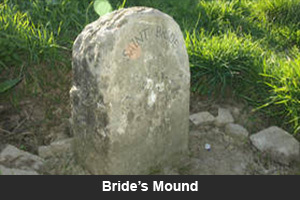 Bride’s Mound is a small hill to the west of Glastonbury in an area called Beckery island. After many years of neglect, this land is responding to the love and care from Friends of Bride’s Mound and is once again taking its rightful place in the Glastonbury landscape as the western gateway to Avalon. Surrounded by beautiful gardens and orchards it is a living sanctuary in which the visitor can experience the quiet healing of this sacred place. For over two thousand years this has been a place where people have gathered to drink the waters and find solace, peace and inspiration. 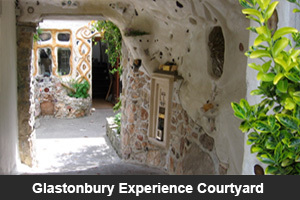 Set in 37 acres of beautifully peaceful parkland. Since Medieval times, the abbey has held legendary status as the earliest Christian foundation in Britain linked to Joseph of Arimathea and the burial place of King Arthur. At the bottom of the High St, through an alley next to Courtyard Books, is a collection of shops that are as interesting on the outside as within. 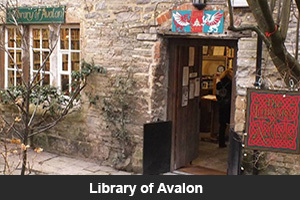 Also home to the Library of Avalon and the Goddess Temple. 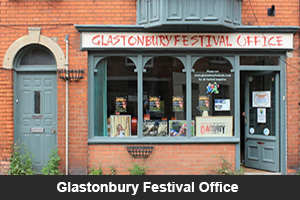 Originally the base for the Festival within the town of Glastonbury, the office is an understated reminder of the existence of the event that is held in nearby Pilton. 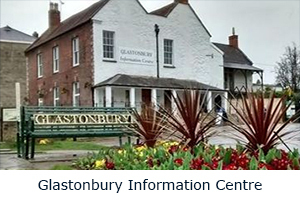 With many of its staff having recently moved over to new offices on Worthy Farm, this building now serves many purposes, including housing Children’s World Charity, and musical workshops for children. 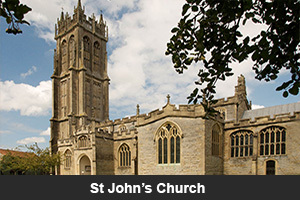 Registered as a Place of Worship in 2003 and believed to be the first such place in the UK to be officially recognised for 1500 years. 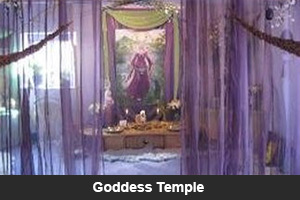 During opening times, the temple is attended by Priests / Priestesses of Avalon and volunteers known as Melissa’s. 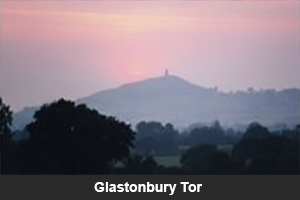 There are many myths and legends associated with the Tor – it is the home of Gwyn ap Nudd, the Lord of the Underworld, and a place where the fairy folk live. 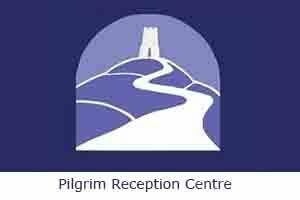 See the Glastonbury Tor website for more myth & history. The Tor is now owned and cared for by the National Trust. 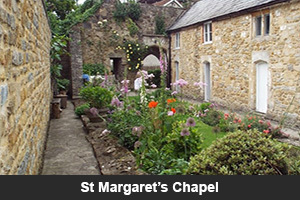 Between April & October the Tor Bus runs between the Magdalene Street car park and the base of the Tor. There is free access to the public at all times. 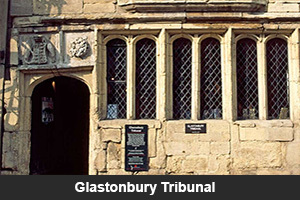 Glastonbury Tribunal is a fine, late 15th-century stone town house with an early Tudor façade and panelled interiors, once thought to have been the courtroom of Glastonbury Abbey. The Tribunal now houses the Glastonbury Lake Village Museum. Re-opens Easter 2019. Known as the ‘Oaks of Avalon’, the two trees are said to be a traditional point of entry onto the island, and were also part of a ceremonial Druidic avenue of oak trees running towards the Tor and beyond. Sadly, Gog is now dead but his remains are still there. 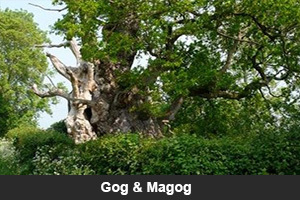 Magog is also close to the end of her life. 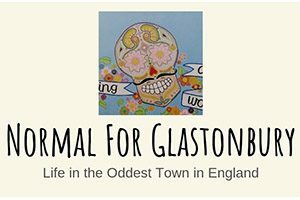 Maybe the only publicly-accessible esoteric library in the UK. A public reading-room is provided for the use of non-members, with full reference access to the displayed collections. All visitors are welcome. Originally dedicated to St. Benignus, an Irish Saint who died at Meare 470 A.D. and whose remains were transferred to the Abbey in 1091. 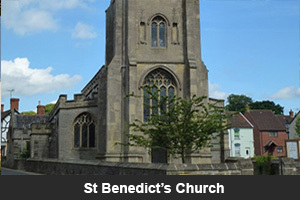 Built by Abbot Bere circa 1500 the present building is of Perpendicular design with the south Aisle added in 1896. The porch contains an interesting arched altar recess and small window facing the Abbey Gatehouse. 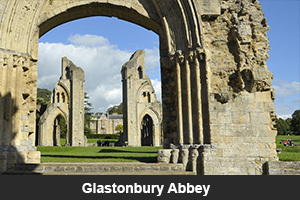 A site of prayer and healing since the 13th Century when they were part of Glastonbury Abbey. One Almshouse is open to visitors to get a sense of life here in the 16th century. The gardens are tended beautifully, and are lovely to sit in. 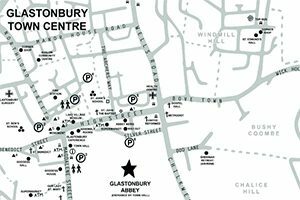 The Glastonbury Tercentennial Labyrinth resides in the churchyard of St John’s. 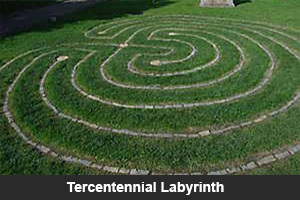 It is a grass labyrinth of the classical seven circuit design: its path delineated by blue lias stonework, a local stone present in Glastonbury Tor. The church is currently undergoing a major renovation and will be closed for most of 2019 therefore the Labyrinth can be seen through the railings but it is not possible to walk it at the moment. 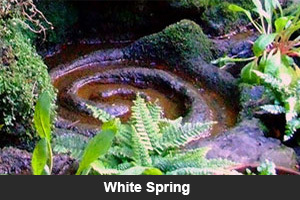 We sought to create a Temple here in honour of the Spirit of the White Spring. 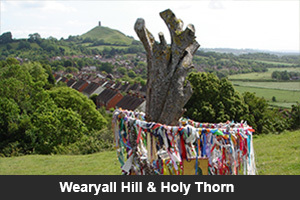 The White Spring water flows through it, as does the Ley Line known as the Michael line. Cavernous and set apart, in blackness or candle lit, mysterious it remains. 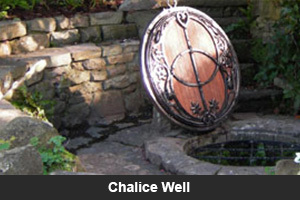 A stark contrast to the wonderful gardens of Chalice Well of the Red Spring.